Flintshire residents who have accessed support services in the county have been given a head start looking for work in the construction sector thanks to a partnership training initiative. ODEL Involve, a Flintshire advice and support service run by Clwyd Alyn Housing Association in the Old Court House Café and Community Hub in Flint, recently got together with ENGIE, one of Clwyd Alyn’s development partners, to host a three-day training event as part of the Construction Skills Certification scheme’ (CSCS). The course is fully accredited by the Construction Industry Training Board (CITB) and once successfully completed, it gives trainees the necessary certification and health and safety training allowing them to take part in work placements on construction sites. 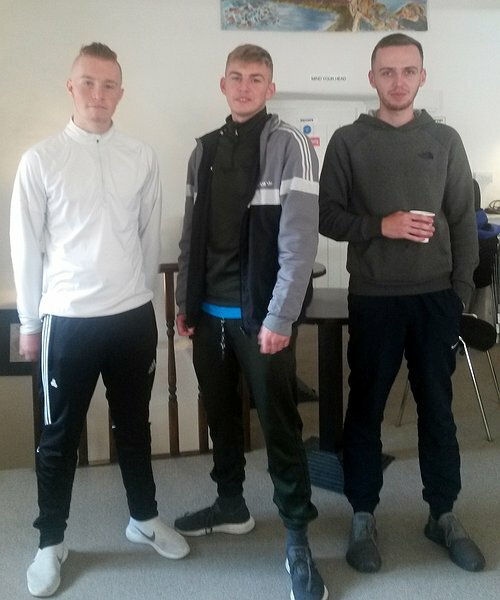 It’s the third time the CSCS courses have been provided by the partnership with one trainee already securing full time work and twelve trainees successfully gaining the CSCS certificate. All 12 of the latest course have reached a standard where they have been put forward to take the certification test in the near future. “This is an excellent partnership initiative that is making a real difference to the life-chances of many vulnerable residents in the county,” said Louise Blackwell, Community Development Officer with Clwyd Alyn Housing Association. “ODEL Involve work with many clients across the region, not only with residents living at schemes managed by Clwyd Alyn. They were able to link in with the Flintshire Support Network (FSN) group to promote the training opportunity. They identified that many are interested in working in the construction trade, but cannot access work placements without the necessary initial training which allows them to go on site. “ENGIE, who are currently working with us to build the new Maes y Dderwen extra care scheme in Wrexham, kindly offered to provide a series of training opportunities to help meet this demand. “This is a really practical partnership initiative that is helping to make a real difference in people’s lives,” added Louise, who thanked Liz McCloskey, Senior Community Engagement Officer, Nicki Sorton, Community Engagement Coordinator, with ENGIE, and Vicky Evans, ODEL Involve Manager, for all their hard work and commitment. "Volunteers brave the elements to raise funds"